Superior mesenteric venous (SMV) thrombosis is a rare but potentially deadly complication of laparoscopic bariatric surgery. Because many patients present post-surgery with abdominal pain, radiologists need to be knowledgeable of the imaging findings on CT of SMV thrombosis so they don’t overlook this complication. These are described in an article published in the Journal of Computer Assisted Tomography. Abdominal pain following laparoscopic bariatric surgery is more commonly associated with surgical complications, such as small bowel obstruction, anastomotic leak at the surgical site, intra-abdominal abscess. It may also be caused by appendicitis, diverticulitis colitis, enteritis, kidney stones, gallstones, cholecystitis, or pyelonephritis. SMV thrombosis occurs in approximately 0.3% of patients who have undergone laparoscopic-guided bariatric surgery. Radiologists at NYU Langone Medical Center in New York City, a Bariatric Surgery Center of Excellence, diagnosed only six cases of superior MVT, or 0.0007%, among the 8,736 patients who had the surgery between 2009 and 2015. These patients presented with abdominal pain, constipation, and/or emesis approximately 12 days following surgery. Lead author Bari Dane, MD, a fourth-year radiology resident, and colleagues defined SMV thrombosis as hypoattenuation within the portal, superior mesenteric, splenic, or other vein. A partial thrombosis demonstrated contrast opacification surrounding the thrombus, whereas a complete thrombosis did not. They defined mesenteric edema as increased density in the mesenteric fat, and bowel edema when there was regional mural thickening with our without a stratification pattern in small bowel loops within the drainage territory of the thrombosed vessel. 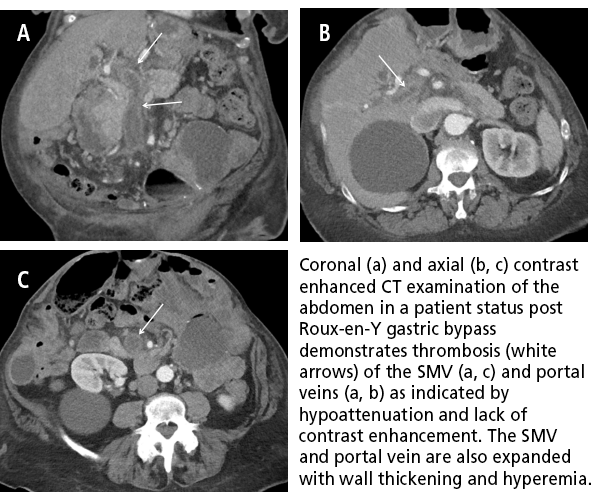 The authors reported that thrombus extending beyond the SMV was identified in the splenic vein in 4 patients and in the portal vein in 3 patients. One patient had right gonadal vein thrombosis. Four patients had mesenteric edema and 2 patients had bowel edema. Five patients had developed collateral veins surrounding the SMV. Thrombosed mesenteric wall thickening and hyperemia were seen in 3 patients. This condition also occurred in one patient when the clot recanalized, transitioning from completely to partially occluded. Dane B, Clark J, Megibow A. Multidetector Computed Tomography Evaluation of Mesenteric Venous Thrombosis Following Laproscopic Bariatric Surgery. J Comput Assist Tomogr. 2017 41;1: 56-60. Identifying superior mesenteric venous thrombosis in bariatric surgery patients. Appl Radiol.